For months, I've seen and heard of this Vietnamese restaurant from friends. I honestly wondered where it was in Quezon City. When I learned it was in nearby Banawe area, I thought to myself - how strange! Hahaha!! I've been meaning to try it, but I haven't had the chance yet. Until - lunch time today. This morning was quite hectic - my friend Kath and I went to Divisoria, specifically 168 Mall and 999 Mall to do some shopping. We were undecided where to have lunch - but I thought, since we were done shopping, why not just have lunch near our area. Kath suggested to go to this Vietnamese restaurant that she has been frequenting - Tra Vinh. 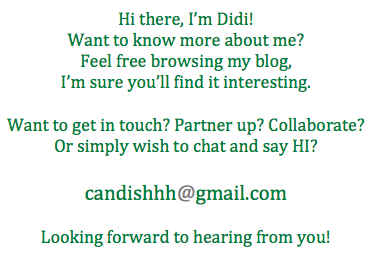 I welcomed her idea and was quite excited - in my mind, FINALLY - I'll be able to try it. Okay, so what do I know about Vietnamese food? I've never been to Vietnam and so the only place I've had it is in Pho Hoa. I knew that pho meant noodle soup. So I was looking forward to the broth. Tra Vinh is located along NS Amoranto (formerly Retiro) and is quite easy to spot. It's across Cajun aka Chef Tony's Popcorn. The place is clean, quiet and fairly new. There were TVs around showing movies that I can only guess are Vietnamese movies. The staff is quite warm - I'm impressed that they're very helpful. I am very particular with broth. Whether it be in a ramen or just any noodle soup. Growing up with my mom and my Ama (grandmother)'s cooking - I can spot an honest to goodness broth from one that is made with powders. For me, a noodle soup's make or break factor relies heavily on the broth. On first taste of the soup - I can gauge very well if it has passed or failed my standards. When I took my first spoonful of the hot soup - I immediately knew that it was the REAL thing. Just the way a broth should taste like (based on my standards). Ask Kath, I couldn't help taking spoonfuls after spoonfuls of the soup! The broth was clean and very flavorful - I don't usually like wansoy, but the chopped wansoy did wonders to the flavor of the soup. It was really good! The noodles were just right - and the beef ball was really really good! And I don't like beef balls! Hahaha... I really really enjoyed my bowl of pho. I have been messaging Michael, the chef and owner (over IG) I asked him for some details on the pho and he said that the one that I ordered - the Combination Beef Noodle Soup's broth is made from beef bones base with sixteen (16) traditional herbs and spices combined with cooked beef shoulder slices and raw NZ ribeye slices topped with imported beef balls, beef tripe and garnished with garden fresh herbs. Kath ordered the spicy pho. And to be honest, it looked really scary - it was so red, as in really really RED! Hahaha.. Kath told me to try it but I was too chicken. Plus, it was midday and hot. Hahaha! 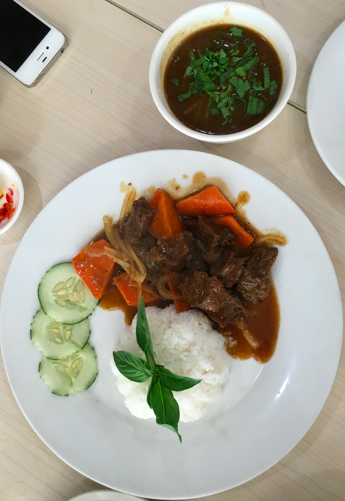 On the way to Tra Vinh, Kath mentioned a braised beef dish - she said that the taste brought her back to when we were in Beijing. I immediately told her that I'd be willing to share an order with her. And this is what it looked like. The braised beef was served with rice and a bowl of extra sauce. I honestly wondered why there was an extra sauce. I mean, won't you? Hahaha!! But it was there for a reason, pala! One taste of the sauce - just the sauce alone, brought me back to our good old Beijing days. It was rich, it was thick, it was really good. Just how I remembered braised beef in Beijing was. It was a great idea for the sauce to be on the side, I couldn't help but eat more rice with it! Hahaha.. This costs P210.00 per serving. Before we finished our meal - I decided to order the Spicy Combination Noodle soup to take home for my Panget. It costs P230.00 for the regular one and for the Large P299.00, the picture below is the regular one. Panget likes spicy food and I think based on Kath's reaction to her meal - well, I decided to order one. I tell you, it really looked scary RED! So for dinner, I heated this up for my Panget. Are you scared? Because I was. At this point - I was too curious already. I set aside my fear and decided to just taste the broth. I don't care anymore if my taste buds get burned. Hahaha! The broth was perfect! The flavor, the spice - the combination was DEADLY. It was really really really really VERY GOOD! The spice was subtle at first and then it builds up to a point where you can still enjoy the spicy experience without burning your tongue. It's not too hot that you'll stop - instead it'll do the exact opposite! I found myself stealing spoonful after spoonful! Hahaha! I even instructed my yayas to try the broth! They too said it was very good - it was their first time to try that kind of broth! The combination of the basic broth mixed with the spices was perfect! When my Panget tried it - he agreed that it was very good. Very very good. He really loved it so much, that he asked me instructed me to go back tomorrow to buy take out! So, if you happen to be in the area - try TRA VINH! Just some trivia - I was messaging with the owner Michael and he shared some details with me. Thank you for indulging me, Michael! 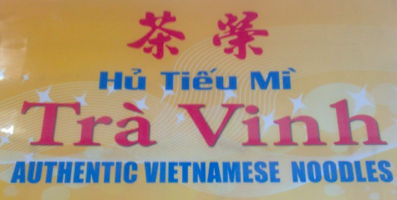 Tra Vinh (the name of the resto) came from Perth, Australia. There are 2 branches in Northbridge and 1 in the northern suburb of Perth. Michael was personally taught by the chef (in Perth)- he was taught how to cook all the broth and how to make the sauces. Tra Vinh prepares their broth the traditional way - meaning they don't use pre-mixes. Michael says they use real meat bones for their borth. After the required cooking time, they discared the bones AND they don't just top up the broth with water just to lengthen the flavor. They also prepare the dishes by order - no pre-cooking! Also they offer four (4) kinds of noodles too, to the preference of diners. I haven't tried Vietnamese restaurant yet but if ever I'll visit that restaurant, I will try the beef noodle soup. I don't think I've ever tried Vietnamese food before. But I do love soup! Maybe I can try this out too when I'm in the area. Never heard about Vietnamese cuisine before here in the Philippines. I will definitely try this. Haven't had Vietnamese since I was a kid. Something to try again with the family this time. Looks yummy.... too much food in this thread I already making me hungry (as in - lolo)! I have been going back since my husband discovered this place months ago. I love the shrimp and pomelo salad. Try the restaurant across that serves good takoyaki if you are fond of it. I love Vietnamese foods and my favorites are Phở,Bánh mì and Spring rolls. I will keep these dishes on my list and will try it next time :-) Thanks for sharing! we'll drop by here the next time magawi kami ng divi!